with a downcurved tip and serrated edges. 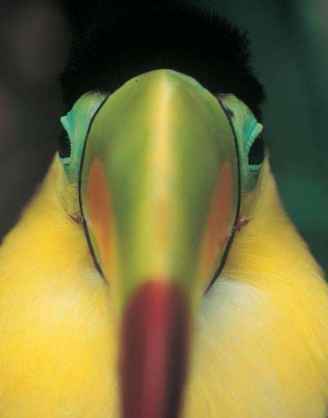 Another trait characteristic of toucans is a tongue with a bristly or brushy tip. Toucans range in length from 13-24 in (33-60 cm). 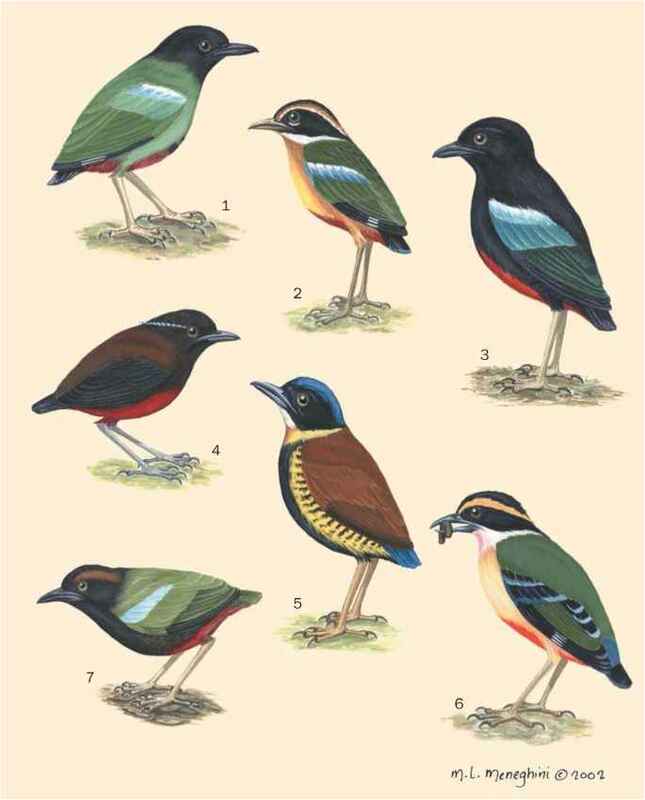 In almost all species, male and female look alike; only the black toucanets (Selenidera) and green aracari (Pteroglossus viridis) are sexually dimorphic. The toe arrangement is zygodactylous, with two toes projecting towards the front and two to the back. Naturalists have long puzzled over the significance of the toucan's large bill. Originally, observers suggested that the bill was a weapon used to defend the nest cavity. This is not so; when toucans sense danger, they come out of the cavity entrance in a hurry, threatening the enemy only out in the open, if at all. Instead, a long bill enables these rather heavy birds to pluck berries from the tips of branches without leaving a stable perch. A thin, dark-colored bill would, however, be just as useful for this purpose. Possibly the toucan's bill plays a role in pair formation and in the social life of the group. According to E. Thomas Gilliard, it acts as a signal. However, toucans can also use their bills to threaten those birds whose nests they plunder. Tyrant flycatchers and even small raptors are frightened by the giant bill, which is even more effective because of its lively colors, and they fly about helplessly while the toucans devour their young or eggs. Other birds will attack a toucan only while it is in flight, because it is then unable to defend itself with its bill.